← Legitimacy of the lawmakers? Don’t make me laught! How to locate a pet? What would be the best way to put a tracker on my cat? I’d like to be able to find him outside in case he ever gets injured and can’t return on his own. This entry was posted in advice requested, pet and tagged cat, GPS, Gremlin, RFID. Bookmark the permalink. 11 Responses to How to locate a pet? they have GPS collars that use cell networks to report their position. You can then look up on the internet where they are. apparently GPS is too heavy for most cats. Best Practice: Don’t allow your cat to roam outside. I know lots of folks do it, and the cats definitely enjoy it, but odds are something bad will happen eventually. Outside cats have a significantly shorter lifespan than indoor cats. 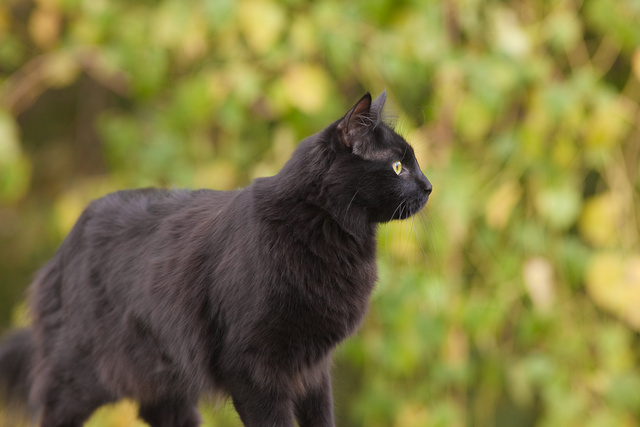 Understanding that, if you still decide to let kitty wander off your property : GPS and Sat systems are notoriously unreliable, for reasons previously noted (size considerations and failure to keep signal contact if the cat is in an obstructed area). A unit tough enough and powerful enough to get and send good signals most of the time will be too bulky and heavy for the cat to carry. Most of the weight is battery related. Best overall options for increasing the odds of return should your pet become separated from you is an owner id tag with your name/contact info and a microchip embedded beneath the skin so that Animal Control or Vet can scan for it. I’ve been in the Animal Control and Human Law Enforcement field for over 16 years now. I second Paladin, with the modification: if you want to let Gremlin outside, build him a fenced enclosure that he cannot climb out of. I’ve lost too many cats. It is not a pleasant experience and I do not ever want to repeat it. I hope Gremlin never gets lost, or run over, or eaten. Take care of him. He’s a beautiful cat. My cat has an RFID chip implanted just under the skin. It’s relatively simple and painless for the cat (after the needle part) and works very well. I have two separate clans of coyotes living within 3/4 mile of me, and consequently, no outdoor cat is safe, they are all just lunch for the coyotes. I faced a large coyote down in my yard this spring, and he only altered his course loping toward me when I started to draw my Bulldog 44, but by the time I cleared the holster, he was almost off my property, so I did not fire. He was a large one, and had a rear track footprint of 4.25″ where 2.5″ is normal. I estimated 45-55#. He is from the clan which lives within 200 yards of me, and was headed back to his lair. Dogs are good trackers. Teach your dog to find your cat on demand. We have coyotes, great horned owls, hawks and eagles all very near our place, plus a few racoons, skunks and porcupines. The cat spends much of his time outside, and likes to hunt. If he weren’t out catching mice I’d figure he wasn’t carrying his weight. All occupations have their risks. The wost that’s happened so far is he tried to take a squirrel, which in turn took a small chunk out of the cat with its razor sharp incisors. Cat got over it. Cats kill indiscriminately when allowed outdoors. If you don’t mind your animal killing a large number of baby songbirds in their nests, baby rabbits, small reptiles like lizards, and so on, then by all means let Gremlin out to hunt. Just realize that when Gremlin is unsupervised outside, he is going to hunt, and kill. not cheap but some incredible miniaturization.